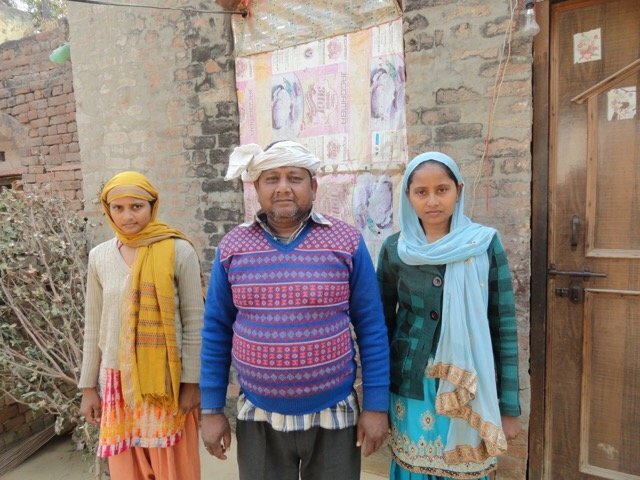 "We are preparing to become Police Women"
Babita and Savita with their father, Birbal. To date, Blossom Bus has served a total of 797 students. In the 2018-2019-year, Blossom Bus served 328 individuals from 15 different villages. Within those numbers, 40 of the students are enrolled in college and 7 are enrolled in master’s programs. Below is a field report about Babita and Savita, sisters who are preparing to become police women. 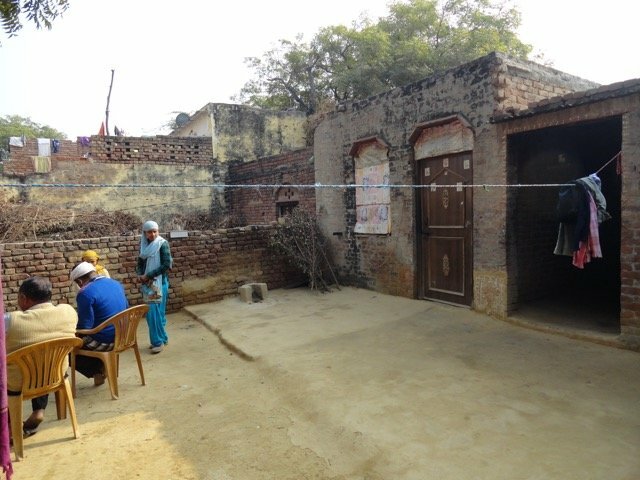 We met Babita and Savita on the 5th of January 2019 at their house in Bhanguri village. The Blossom Bus served them in their undergraduate degrees and is now serving them as they complete a Law Enforcement master’s degree in Palwal. They will graduate in 2019 and are very happy to be the first in their village with master’s degree. Savita and Babita are both smart while Savita is outgoing and Babita is a bit shy. I asked them “why are you so serious about your studies when most of the people in villages think that there is no use of education as there are no jobs available after graduation?” to which Savita very promptly replied "jobs are available, and we have to become qualified to grab them. How can we expect to get a job when we are not qualified for one” she said. Their father Birbal told us that both Babita and Savita have completed the written examination conducted by Haryana Police and he is hopeful that both his daughters shall become Police Women soon. They are also preparing for exams for a job with the Delhi Police. Birbal works as a casual labor at a small toy factory in Palwal and gets a meager salary but he is determined to get his daughters educated. 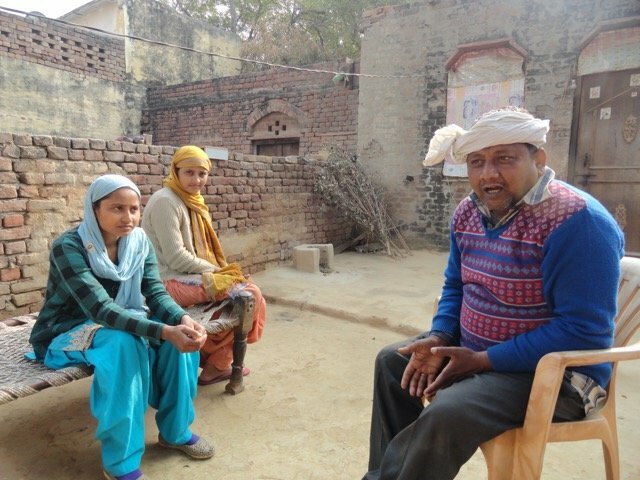 Birbal told us that he is supporting his daughters in every possible way and accompanying them to the examination centers or any department for tests and job interviews. Birbal stated that this dream for his daughters became a reality with the Blossom Bus. He said that he was not capable of spending thousands of rupees on his daughters travel to college every month. “My daughters could not have reached here without the Blossom Bus. The day my daughters will get a job, I will first invite Lotus Outreach for a big THANK YOU. You made it possible even to have a DREAM” Birbal exclaimed with immense gratitude. Mamta, a new Blossom Bus student! Mamta, who joined Blossom Bus this year, was one year old when her father died in 2003. He left behind five children including Mamta, and his wife, Wati. Without him, their family was left with no income. Mamta's mother refused to give up and worked hard as a laborer in the fields and enabled their family to survive on the small amount she was getting as widow pension from government. She raised her children and sent them all to the village school. Her two elder daughters could not go to school after grade five and eight as the school in the village only went up to grade eight. The two daughters were then married and the third one dropped out after passing grade eight in the village school. The son made it to grade ten but has left school since as he cannot afford to travel to the nearby village due lack of transport. Mamta is the youngest and wanted to study so that she could find a job that could help her ageing mother. Mamta was told by her friend that there was a bus available for poor families that provided free transportation to and from school. Mamta’s mother approached the school at Ahrawan and inquired about the bus. She met with the teachers and they assured that the Blossom Bus would have room for Mamta, especially given their families situation. Soon after, Mamta started riding the Blossom Bus and enrolled in grade nine in the girls’ school. So far, she really enjoys her studies and is hoping to complete her education and become the only earning member of the family so that her mother can live in peace. The family is still living in acute poverty surviving on about $50 a month with Wati’s pension. Recently their roof collapsed, and they are worried about the approaching winter. However, Wati is a courageous woman. She smiles and says that she is happy that her daughter could complete her studies and become a respected person in society especially because they belong to lower caste. She says that her daughter could be married into a good family if she completes her education because uneducated brides have no scope for marriage in good families these days. The mother thanked Lotus Outreach and gave blessings to Blossom Bus for this great help she needed the most. Sahila, 16, wakes up at 5 in the morning. Half of her family members are sleeping in their modest dwelling in Jalapur Khaslsa village. She sweeps the floor, plasters the walls with cow dung, and washes the utensils before helping her mother prepare breakfast. Amid this flurry of activity, she quickly puts on a pink salwar-kameez, packs her tiffin, and heads out. On her way, she meets her friend Rasheeda and the two walk towards the spot in the village where they wait for the arrival of a bus. Around 7:20am a yellow bus draws up and the two hop on. The bus is one among five that drop these girls to school and bring them back home. 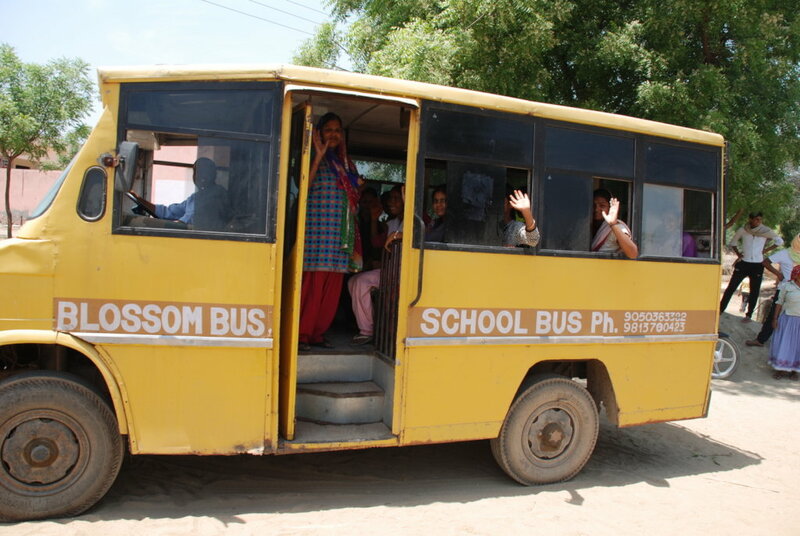 They are part of a program called Blossom Bus, run in the Mewat region of Haryana. Starting with 30 girls in 2010, the free bus service now caters to more than 300 girls who use these vehicles to reach their high schools located at a distance ranging between 2km and 10 km from their villages. 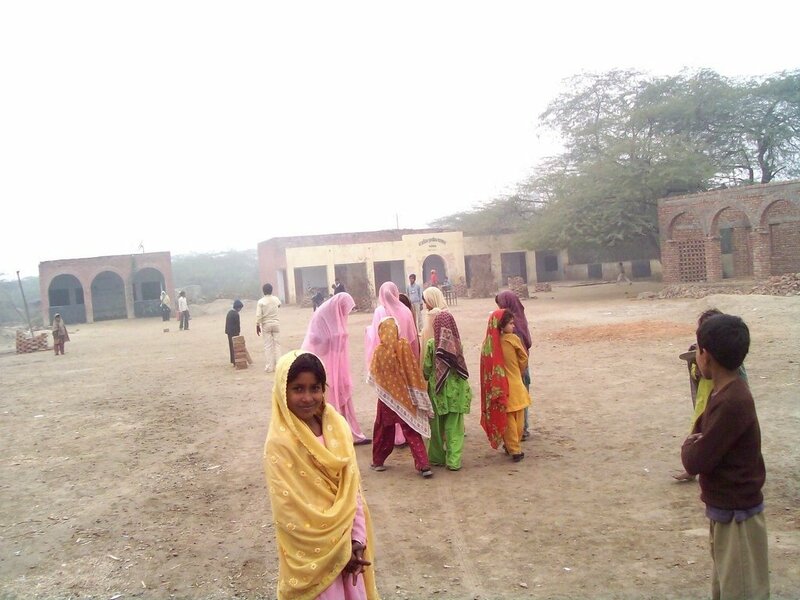 Every morning around 8, Sahila, Rasheeda, and other girls from different villages board the bus to reach the Government Girls Senior Secondary School in Aharwan village in Palwal. 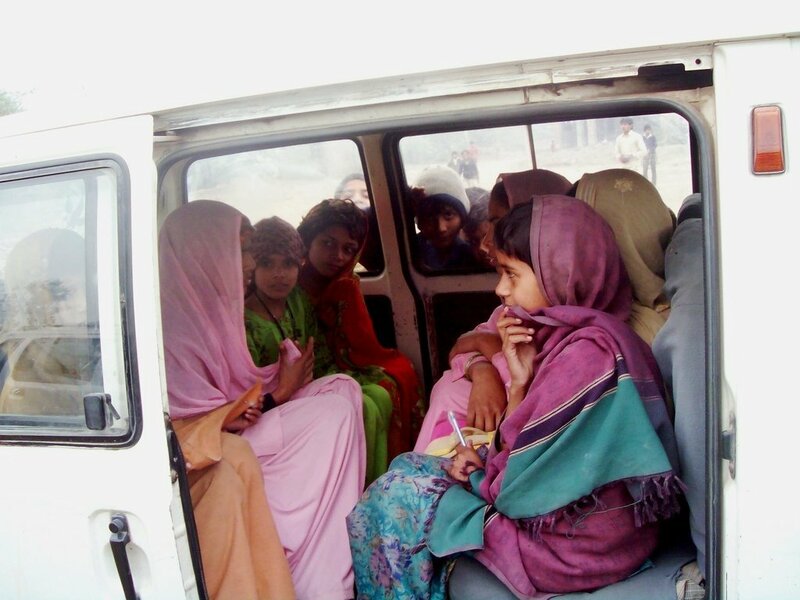 The bus is an indispensable part of the girls’ lives said Sahila. “We wouldn’t be going to school if it wasn’t for this bus service. Our parents would have near sent us so far away as they fear for our safety. The bus service ensures safe transit and fewer worries for our parents. Earlier, girls used to face problems while commuting to school since the boys’ school lets out at the same time. The boys would harass us, whistle at us,” said Sahila. Rasheeda agreed it wasn’t safe for girls to walk back home. “Last winters, the bus didn’t come and I decided to walk back home. A boy from the neighboring school followed me on his motorcycle and pulled at my duppata. Since that day, either I skip school when the bus is not there or tag along with other girls,” she said. Both Sahila and Rasheeda studied in a government primary school in Bhanguri of Hathin Tehsil in Palwal till class 5. Both said had the bus service not been there, it would have been curtains for their education. “The village school was only till class 5. My mother had no plans of sending me to the higher secondary school, which is far off from the village. She was persuaded to change her mind after we informed her about the bus service to the girls’ school,” said Rasheeda. Like other girls in the school, 15-year-old Saniya also wakes up at the crack of dawn. After finishing her daily chores, she helps her younger brothers get ready for school. Her brothers’ study in the boys’ senior secondary school, locate near her school. The school has a handful of girls too, but she still goes to a different school. “Boys can travel anywhere. Who will stop them? My parents did not send me to my brothers’ school since they will not allow me to study with boys,” she said. “Even I would never want to study with boys,” she adds as an afterthought. “Boy’s won’t get up to take a glass of water on their own. 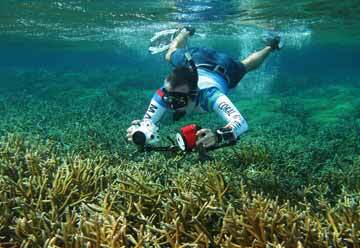 No restrictions are imposed on them. However, a girl is questioned even if she steps down from the terrace,” said Sanuya. Her voice drowned in the sound of the school bell, which rang to announce the end of the lunch break, with teachers calling out to the students asking them to get back to classes. A mid a din of voices and hurried footsteps, the girls retreated back to the classroom in a matter of minutes. A slogan was written on the wall of class 9-A, ‘Padhu lidki, Roshni ghar ki’ (An educated girl lights up the whole house). The bus service has changed the lives of many girls, some are whom are married. Bikal, 16, from Bichpuri village in Hathin, got married in 2008 at the age of 8, along with her sister to save wedding expenses. Unlike her sister, Bikal has refused to go to her in-law’s house until her education is complete. “I don’t even remember when and how I got married. Every year, my sister celebrates her anniversary and tells me that I got married along with her. I will complete my education before the gohna (traditional wedding farewell) happens, provided the bus service continues,” she said. Bikal said she was hopeful that she would complete her education. Like Bikal, 16-year-old Bokah is also married. Both come from Bichpuri. Imagining school life without the bus is difficult they said. “I got married on February 20, 2014. I was visiting my aunt’s house when I was told that I would be getting married the next day. I was happy that I would get to wear a lehenga (traditional skirt) and agreed,” said Bokah. The lehenga has stayed with Bokah but her priorities in life have changed. She now hopes to complete her education and apply for a job in the police force. Suraj said that Mewat was chosen to launch the service not just because of the higher concentration of Muslims in the population. The Ministry of Statistics and Programme Implementation data from 2015-16 shows that among all districts, the lowest enrolment rate was in Mewat district, which has a heavy concentration of Meos. Only 643 girls enrolled in class 11 and 828 in class 12. “Of the 100 students enrolled in school in class 1, only 10% reach class 12. Mobility is a major hindrance as there is no public transport available in the villages of the Mewat region. Safety is the biggest concern among parents and students alike. This is where Blossom Bus service fills the vacuum. 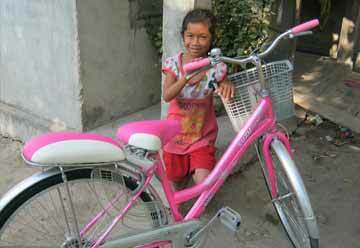 Many of the Blossom Bus girls are first in their village to reach class 12,” said Suraj. The volunteers associated with the bus service also try to get dropouts back to school. Boken joined the Aharwan School in class 6 in 2013. Three years later, she was compelled to drop out of school due her ill health. “I used to constantly fall sick. I left school and stayed at home for two years. There was no one else to look after my mother either. I would not have resumed school, in all likelihood,” said Boken, a resident of Bichpuri village. This year in July, Boken resumed classes. She credits the Blossom Bus for it. “My parents were hesitant about sending me back to school after a gap of a few years. However, the Blossom volunteers convinced my parents. They are no longer worried about the distance that I have to travel to go to school,” said Boken. While many Blossom Bus riders said that they were keen on completing their education, they were not sure if that would be possible since the school they go to is only till class 10. “We have requested that the education department extend the school till class 12. There is no other senior secondary girls’ school in the vicinity. Most importantly, parents want to educate their daughters, and this should be enough to convince the government,” said Satendra Pal Sheoran, who teaches Hundi in school. School authorities said they have given several proposals to the education department to convert the school at Aharwan into a higher secondary institution. However, the request for an upgrade has been turned down repeatedly. Baghel, Block Education Officer, Palwal, said that the school’s proposals were rejected on grounds of lack of feasibility. “Availability of 1.5 acres is a must for setting up a higher secondary school. The high school cannot be converted into a higher secondary school since it doesn’t have the required land. It is located on a much smaller area. If the panchayat gives us the required land, we will happily convert it to 10+12. The school fulfils all other rules,” said Baghel. Drawing and dispensing officer, Ratan, who holds temporary charge as the school headmaster, said that the school would shut down for all practical purposes if the bus services were to discontinue. “The school functions because of the bus service. If you take away the bus service, the student numbers would come down to 50-60. Our daughters would stop coming to school,” said Ratan. Over the years the Blossom Bus service has expanded its area of operation. These buses are also now being used to ferry women to colleges. Some of the girls, after completing education in Aharwan’s girls School managed to complete graduation. 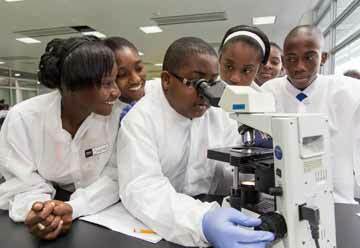 Eight or more are now pursuing postgraduate degrees. 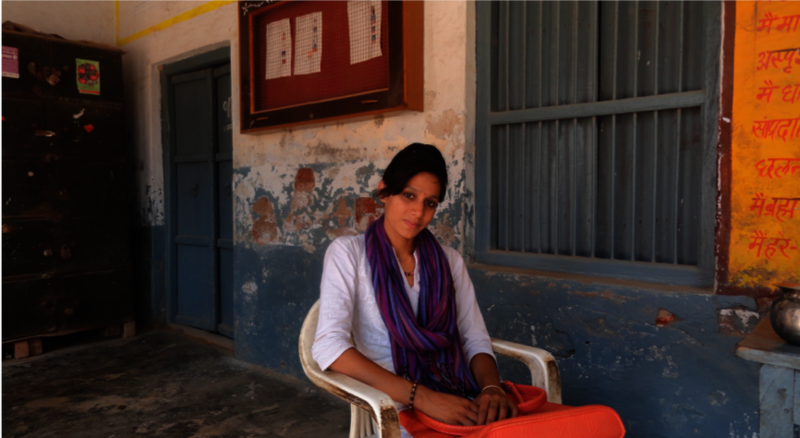 Kumari, 23, is a first-generation college-goer. She is in the final year of her post-graduation in political science. She takes the Blossom Bus twice a day to reach her college in Palwal, which is 8km from her village, Bhanguri. Sarita used to walk to school, but her commute to college has been made easy due to the bus. “The bus service has been like a savior for the girls like me. Our parents got the confidence to send us to college because of the Blossom Bus. Parents are assured about our safety,” said Sarita. Belonging to the Scheduled Caste, Sarita is the only one in her community in the village who has reached post graduation. Encouraged by her example, other parents are also motivated to educate their girls. “Parents come to me to enquire about the service. They ask about the college and if the bus service will help the commute,” Sarita said. Sarita’s father, Jeevan, admitted it is not safe for girls and there is still some social stigma attached to educating girls. “I am not sure if I would have educated my daughter had the bus service not been there. Upper-caste people spread rumors when girls from our community step out of their house. 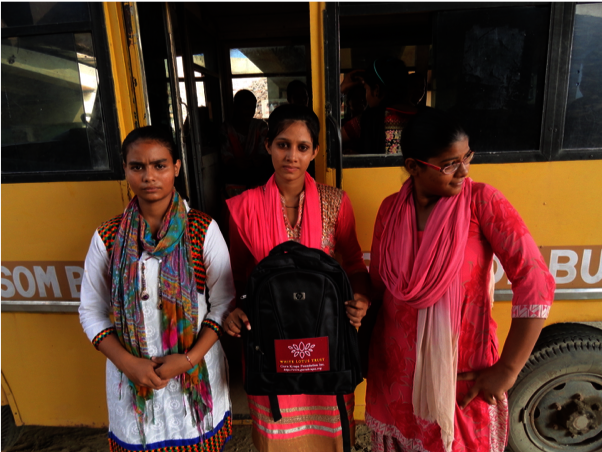 The best part about the bus service is that it picks up the girls from their doorstep and drops them back,” said Jeevan. The safety of the girls is the primary concern of all those associated with the bus service. “When we had launched the service, we used to encounter men who would try to molest girls. Once, two men from Aharwan followed the bus on their motorcycles and passed obscene comments at the girls. The bus driver saw to it that the motorcycling men and their friends knew never to do that again”. 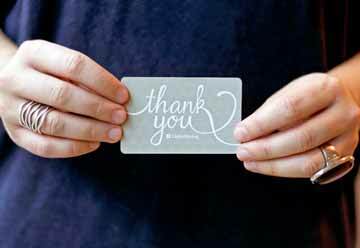 Thank you to all of the donors who have supported the Blossom Bus. Your impact is immense! Many of us living in the developed world, though I’m sure not all, have taken for granted having a bus to take our children to school whether close to or far from home. It’s different in the developing world. 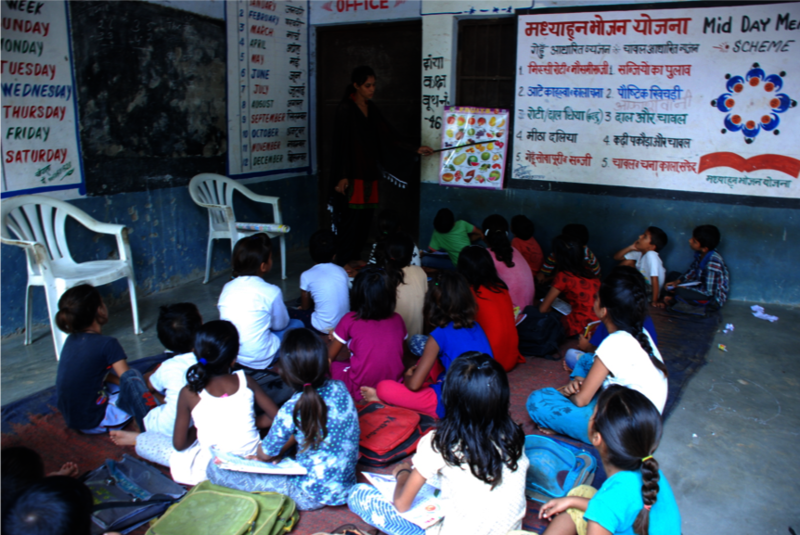 There are 115 million children in elementary education in India, a great deal of them living in remote villages with only a primary school and almost none of them get access to a school bus, except in a few cases where services are made available by organisations like Lotus Outreach. While 315 is a tiny drop in a huge ocean of children, the Blossom Bus has made a big splash in the area we work in where school enrolments of girls above year 9, first generation high school girls, have increased by 100s of percent. Lokesh travelled to school and College for six years on Blossom Bus from Bichpuri village along with around 30 other riders from the same village. Two years back Lokesh was one of six local youths hired by us for an after school teaching program called Equality Education Addition (EQ+). She was paid for that work and earned herself a lot of respect from her village for being a young, educated woman getting a good salary while working in her home village. Recently Lokesh broke another social and economic glass ceiling by landing a job in a local bank with which carries a tremendous amount of respect as a young woman in a male dominated society where almost all the young women are defined by their husband and stay at home looking after children, home and hearth. She is lucky in the sense her parents are very encouraging. Her father wanted her to achieve something and become a role model for the village girls, to motivate them to come out of poverty through empowerment by education. Lokesh is not the shy and timid girl her society expected her to be and told us that riding on Blossom Bus gave her a sense of safety and confidence to ride a bike alone without fear of harassment, especially now that many villagers now see her in the bank and respect her. She also tells us this is only a beginning and that her current position will provide a platform for her to get a much better job after completing her college education. Thank you to all the donors who have supported Lokesh on her journey! We can't wait to see where goes! Overflowing with Blossom Bus riders! "We are Blossom Bus Girls"
We met a number of the 215 Blossom Bus girls studying at Aharwan School today and visited their classes. We also discovered the total number of students in these two classes is now more than 70, which is more than 35 students over the department of education’s limit. While this situation burdens the Aharwan School principal and teachers, they are all deeply devoted and long term allies of Blossom Bus, so they are working on solutions. The School has thus far raised funds from the government and the communities to construct four spacious new rooms to accommodate the increasing numbers of girls coming to attend classes due to the Blossom Bus services. While this solves part of the problem, it is also vital to obtain more teachers because as of right now there aren’t sufficient teachers available for classes nine and ten. The teacher Mr. Balbir informed us, “Seats at our school are in high demand these days because of our very good academic results and a safe environment for girls coming from poor and Muslim families. Unfortunately however, we are unable to provide them the personal attention they should be getting as there are more than 75 girls in each of the grade nine and ten classes. We have requested the authorities to provide more teachers but have not been successful thus far. The girls are working hard and getting much better than average exam outcomes even though they have less time with their teachers than they should. Last year Aharwan Girl’s High School had the best board results in their Ward." While education in government schools at Haryana and across India is still obviously a work in progress, it’s much better these girls are in school getting a good education than anywhere else. We were happy to see Aharvan school in better shape than ever, with more rooms, cleaner than ever and with teachers taking more interest in creating a better learning environment. All of these things have contributed to the girls at this School performing better in exams than in government schools across the state. The teachers thanked Lotus Outreach for our great support and which they say has made a huge contribution to making Aharwan Girl’s High School number one in the Ward.